This book is designed to guide social workers in their work as field instructors. It is unique in that it presents a conceptual system that unites social work theory taught in the classroom to actual practice in a variety of community settings. This system gives the field instructor a model to guide the student through a process that focuses attention on common elements of all social work practice situations. Many examples are presented to illustrate the application of this process. In addition, the text incorporates current research and experience on pre-practicum preparation, the importance of the initial meeting with students, the relationship between field instructor and student, guidance and monitoring of the learning process, evaluation procedures, legal liability and ethical issues, and working with students where age, experience, gender, differing ethnicities, or the presence of a disability may need consideration. Field education is examined bearing in mind the multiple and rapidly changing contexts of social work and social welfare policies and practices, university and service organizations, and professional and legal requirements. 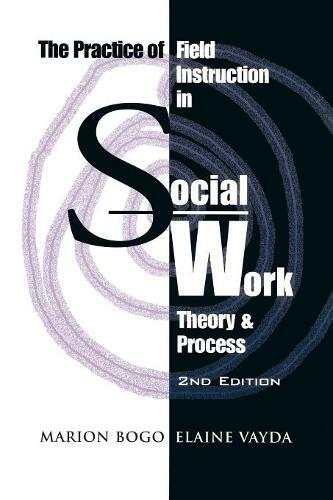 The Practice of Field Instruction in Social Work: Theory and Process is an invaluable text for anyone preparing to become a field instructor, for current field instructors, and for faculty members responsible for field coordination. The information presented here is based on current research and teaching experience. The model presented in the book has been used with success in undergraduate and graduate programs throughout Canada and in other countries.